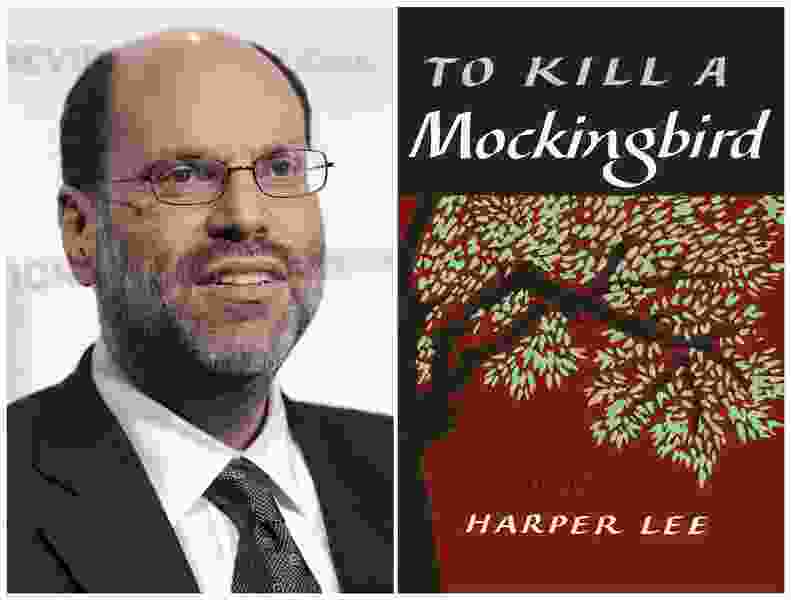 (Evan Agostini | Associated Press file photo) This combination photo shows Hollywood and Broadway producer Scott Rudin in New York in 2011, left, and the cover of Harper Lee's "To Kill a Mockingbird." Dozens of community and nonprofit theaters across the U.S. have been forced to abandon productions of “To Kill a Mockingbird” under legal threat by Rudin. The cancellation of the classic “To Kill a Mockingbird” at Salt Lake City’s Grand Theatre may not be the last word, after a powerful Broadway producer faced a barrage of bad publicity and had a change of heart. Cast members of The Grand’s production were in rehearsals on Feb. 16 when they learned that the production would be dropped because of a legal dispute. Producer Scott Rudin argues licensing company Dramatic Publishing Inc. improperly agreed to allow certain regional theaters — including The Grand — to stage the 1991 stage adaptation of Harper Lee’s classic novel. Dramatic Publishing holds the rights to that version. The Grand was one of at least eight regional theaters that were mounting productions of the 1991 version and had received letters from Rudin’s lawyers threatening expensive legal action if they didn’t cancel their productions. The Grand and several others, without the funds for a legal battle, decided to cancel. On Friday, Rudin — facing bad publicity, an online boycott threat, and a story about the controversy on the front page of The New York Times — relented. Rudin made a stunning offer: The regional theaters that received his lawyers’ letters could produce “To Kill a Mockingbird,” with the new Sorkin script, without a fee. Some of the theater companies — given a rare chance to stage a play that’s still on Broadway — are taking Rudin up on the offer, or contemplating it, The Times reported Friday. The Grand, for now, isn’t one of them. Seth Miller, The Grand’s executive artistic director, told The Times it was too late to mount a new version of the play for the scheduled opening of March 21. Miller would like to try next season, but he’s not sure if Rudin’s offer would still be available then. Miller told The Times that The Grand was going to lose about $20,000 because of the cancellation. The Grand has extended the run of its current play, the romantic musical “First Date,” to March 16, to recoup some of that money.